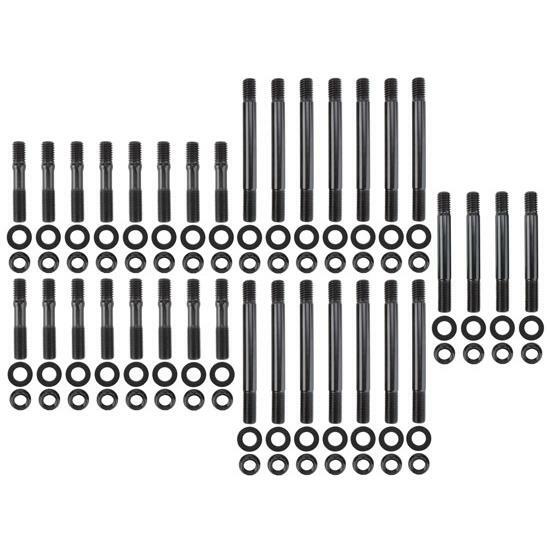 Install an ARP Small Block Chevy (SBC) head stud kit to enhance cylinder head sealing, ensure consistent torque values and help prevent damage to threads in the block. All kits come with aerospace-quality nuts and parallel-ground, hardened washers. Kits include undercut short studs that all but eliminate head gasket failure. Undercut studs have a narrowed area on the center of the stud shank. These undercuts add more tensile strength to the stud. 190,000 PSI. Not for raised runner heads. Tim talks about the new Edelbrock powder coated cylinder heads and provides a little history on Federal Mogul heads. Tim shows off our aluminum cylinder heads for 348-409 Chevys. What style of Small Block Chevy heads do I have? Illustration showing the various styles of engine heads you may encounter on the Small Block Chevy engine.